All of the holiday cottages, hotels and resorts on Holiday Tots are baby-friendly, with everything a family needs when travelling with a baby. We list a selection of fab boltholes here we think are especially suitable for families looking for that first holiday with baby. From small one bedroom cottages to luxury breaks specifically tailored for baby’s first holiday away from home. This charming baby-friendly bolthole is located on Chateau Canet, an award-winning working wine and olive domain in the Languedoc. Shared use of pool, tennis courts and more, including wine tastings and babysitting! Perfect for your first holiday in France with baby. Beautiful baby-friendly holiday cottage boasting 5 star gold rating and 100% cleanliness by Visit England and featured in home design magazines. Baby, toddler and dog friendly and ideal for a family of two adults and a baby or small child. A one bedroom baby and toddler friendly holiday cottage in north Devon, with daily animal feeds, pony rides, lots of play areas and 10 acres to explore. Perfect for a small family looking for a holiday on a farm-stay. There are only two holiday cottages here, making it the smallest farm-stay we have seen so far! Lenvos Gites is a small hamlet of five family-friendly holiday cottages in Brittany. This lovely cosy gite with private enclosed garden, is perfect for a couple and baby. Explore 15 acres of award-winning gardens with a swimming pool and lots of facilities for babies and toddlers too. A one bedroom baby-friendly holiday cottage in the beautiful Boyne Valley in Ireland, ideal for a couple and baby/toddler. This open plan suite is perfect for a couple and a baby or toddler looking for a holiday in France. With a bistro, bar and magnificent infinity pool in the grounds. A luxury retreat for your first family holiday with baby. A charming holiday cottage in southern Brittany close to the Loire border and ideal for a family of up to two adults, two kids and baby. Situated on a small family-friendly complex of just three holiday cottages with shared swimming pool, toys, play areas, games, animals and lots of baby equipment, it is a lovely location for a family holiday with young children. This is a beautiful little baby-friendly cottage ideal for parents with a child in a cot. Enjoy the great location for family days out and exclusive use of the swimming pool and great play areas. 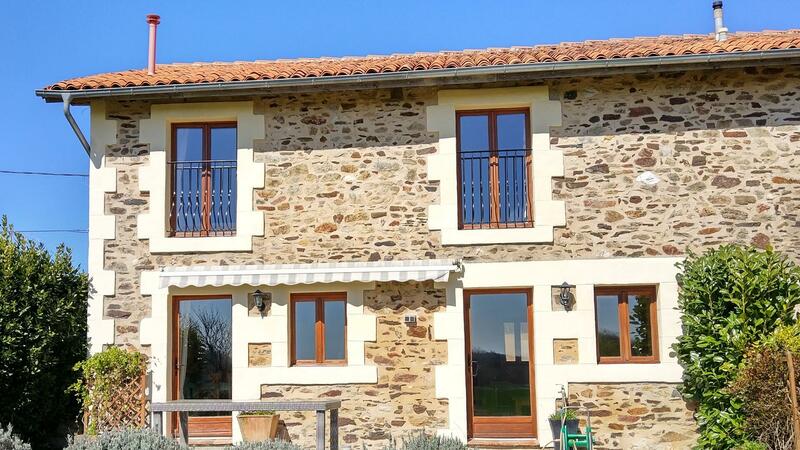 Puce is one of four child-friendly holiday cottages at Boutillon Gites in France. It is the smalles cottage here and is ideal for baby's first holiday or toddler, with private west facing walled garden and full use of facilities. Great location for exploring South West France and its beaches, towns and villages. A delightful stone cottage for a couple and baby/toddler in this beautiful private estate, Manoir de Longeveau, on the Charente/Dordogne border with clubhouse/restaurant on-site. Swimming pool and lots of baby and toddler equipment available too. A lovely cottage set within 14 acres of meadows and woodland with a private walled rose garden. Two heated swimming pools, animnals to feed, play barn to get busy in, grounds to explore and a great selection of outdoor games including a football pitch! Chateau de Gurat is a wonderful location to spend a family holiday with young children. A gorgeous, comfortable rural cottage in Suffolk with private hot tub and patio, shared indoor pool, farmyard visits for children, spa treatments available and onsite farm shop. Brilliant location for exploring Suffolk too - ideal for couple and baby/toddler. Sea views, Cornish cuisine, swimming pools, complimentary afternoon tea to Holiday Tots guests and Edwardian beauty are all on offer at this luxury family friendly hotel in the Lizard Peninsula. Laid back luxury family friendly resort and spa in Jamaica with a seven-mile white sandy beach, water park, kids clubs for all ages offering a luxury all-inclusive holiday the whole family will enjoy. Luxury child-friendly hotel in Lisbon, Portugal, with a fabulous location for a family city break. The complimentary kids club is open early to late and so you can take time out and explore with or without the little ones. Each family-friendly hotel room also has a kitchen area and has been beautifully designed and furnished. A great baby friendly bolthole set in 22 acres of Cornish countryside near St Austell. Shared pool, indoor play area for little ones under 5 and farm animals too! 10 minute walk to village. A lovely baby-friendly coach house apartment situated in this delightful estate in Normandy with onsite Bistro, river setting, walking distance to the village, beaches 15 mins by car and onsite activities including play barn with ball pit plus babysitting and meal delivery service. This wonderful farm-stay is home to six child-friendly holiday cottages, an indoor swimming pool and an assortment of animals to feed. For the kids, indoor play room, lots of outdoor toys including a wooden pirate ship and so much more... Family dogs members are welcome too. This really is a farm-stay for the whole family! A stylish and indulgent Five Star Awarded child-friendly Eco Cottage with a private enclosed garden and wonderful views over the countryside. A fabulous Cornish farm holiday experience is to be had at Trevorrick Farm, fun for all the family with great facilities including and indoor pool. Close to Padstow. 1 of 3 beautifully restored gites and ideal for 2 adults and a baby/small child. Access to a swimmimg pool, 6 acres of grounds and lots of things for the kids to do, including treasure hunts and pizza making! All-inclusive family-friendly luxury spa, golf and waterpark resort in Jamaica, voted top 25 for families in the Caribbean. The whole family will love it here, twenty two acres of lush tropical gardens, private golden beach, swimming pools and lots of family-friendly activities too. This newly converted barn within a secluded and private courtyard has been specifically designed for families with babies and pre-school children. This cosy baby friendly cottage is the ideal base for exploring the Peak District. Beautiful remote location with lots of equipment for your little one. This newly built holiday cottage is in a great location for the village, beach and pub! The ideal spot for the whole family. This baby-friendly bolthole in Normandy boasts beautiful grounds, enclosed swimming pool, tennis court, animals on site, babysitting, free bikes, home-cooked meals and walk to local town. An all-inclusive family resort in Turks & Caicos offering a range of luxury child-friendly holiday accommodation, from stylish resort rooms and suites to beachfront villas. In this Caribbean resort there are multiple restaurants, a waterpark and a kids clubs for every age. It’s easy to see why it has been voted the world’s leading all-inclusive family resort 19 years in a row. One bedroom luxury baby-friendly cottage in the Cotswolds, Oxfordshire, located in a stunning country estate with play areas, spa, pool and gym. This is one of the smallest cottages at Bruern and perfect for grand-parents or a couple for their first holiday with baby. A cute baby-friendly self-catering holiday cottage in Brittany just 30 minutes from St Malo. Possibly the perfect adventure for your first holiday with baby. Beaches are beautiful and clean, villages and fishing ports historical and fun and these holiday cottages are full of lots of baby and toddler equipment too! 20 mins from Faro you will find this child-friendly holiday resort in the prestigious Quinta do Lago area, Algarve, Portugal. Offering a collection of independently owned villas and 2 bedroom town houses with private gardens and pools. Facilities in the resort include kids club, games rooms, play areas, bars etc. Pierre's House at Hameau de Montengrand is a lovely baby-friendly holiday cottage sitting within 30 acres of tranquil grounds sharing a fully enclosed swimming pool with four other child-friendly holiday cottages, honesty shop, babysitting, and more, all on the beautiful border of the Areige and Aude departments in southern France.